Let’s look at the words Mr. Jenkins has used. You will see that there is a similarity amongst all the words and verbs used. Kata is a record, a transmission, a recording. I want to share with everyone one of the experiences that changed my way of thinking when I was in graduate school. Of course, in university, whether at the undergraduate or graduate level, there are always courses that we are obliged to take, compulsory courses that in the belief of the constructors of the degree program, they deem it necessary for us to experience to broaden our knowledge. One such course was a course entitled EDUC 5P81: Personal Narratives in Educational Research. In the course, we were to explore the nature and understanding of story from a variety of perspectives, and the use of story as a framework and tool for teaching, learning, research, and personal and professional development, as the course description says. Well, the graduate students I was with in the class all scoffed at this course. What nonsense, exploring the nature of story! What does this have to do with real educating? Why do we have to take this Mickey Mouse course? It didn’t seem particularly relevant at the time, when we were all hankering to learn about educational theory and technique, the really important stuff. What does personal narrative have to do with it? It also didn’t help that the instructor was an old female who was very soft-spoken and a little feeble in her control of the class. By the end of the course, I did have a begrudging bit of respect for the course and the instructor. We had explored our personal views on various educational theories. Fine, but we all still scoffed at what we thought was a monumental waste of time. I must admit now, twelve years later, that it was one of the most memorable courses I took. We all thought we were so smart. Maybe she was right all along and we were the ones who had something to learn. And what she taught and believed in was called “The Story Model”*. “The basic premise of the Story Model is that we make meaning by telling stories. Humans for all of recorded time have told stories. We believe that students will come to develop meaning and understanding by exploring their own personal stories and the stories of others.” (p.9). Seems pretty innocuous, doesn’t it? No wonder we scoffed at it as young graduate students. But let’s sit back and think about it for a while. Now, the stories are on film. In old times, it was in books. Before that, in scrolls. Before that, on tree bark. And before that, on cave walls. OK, OK, this is fine for education. But what does this have to with teaching kata in martial arts? Let’s think back to what Mr. Jenkins said about kata: it is a record, a recording, a transmission. In short, it is a story. Kata as a story. Intriguing idea. Let’s pick an example. How about iaido? A kata like “san-pō giri” from the seitei-gata for instance. How to teach it to a student? If you try to teach it this way “cut here, here and here”, what do you think the student will think? Do you think he’ll remember it? Will it have any meaning to him? Probably not. It’s too cut-and-dried. It’s like memorizing a set of random numbers. It’s meaningless. Now it has meaning. Why? Because it has a story. Everything in the kata now makes perfect sense. Why we walk like this. Why our hands are here. Why we draw at this moment. Etc.. etc… It is put in a context that we can understand and more importantly, that we can easily visualize. Context? Yes, a context basically just means a situation. The techniques are placed in a situation. In essence, when encountering this type of situation (or scenario), here is one way to deal with it. We could just learn all the techniques on their own, without context. Cut head, cut yokomen, cut waist, cut wrist, stab belly, etc… Over and over again, argumentum ad nauseam. They become like the random numbers. Meaningless. But in a story, they come alive. And to the story elements, we must add characters. With characters, comes movement because in a swordfight, no one is static. With the movement of all the actors, there must inevitably be included a variety of tactics and a rationale for actions and movements and techniques. “We make meaning in our lives through story. Woven throughout our personal stories are our values and beliefs.” (p.9). Values, beliefs. Basically a rationale. In old sword arts, it is what the founder thought was effective or what he believed was the best approach to take and technique to use given the circumstances. Even technique has a rationale. For example, why we cut like this. Why we bring the sword up like this. Why we choose this degree of angle on the cut. And so on. His rationale, his belief, his values. Transmitting knowledge. Like Plutarch, Cicero, Dickens. Story-tellers. But all of them telling a story and making a critical social commentary at the same time. Critical commentary based upon beliefs and values, upon principles. Transmitting knowledge about beliefs and values. Likewise, in kata are embedded the principles of the founder’s belief. For example, the idea of three inches in Shinkage Ryu. Why uchi-otoshi is a core technique and principle in the Ono-ha Itto Ryu style. The supreme importance of agility and mobility in Katori Shinto Ryu. These are the core beliefs and values of the founder: how he thought about the best way to fight and how he envisioned combat. And, much more significantly, how the founder envisioned how to control the fight. That’s why Shinkage Ryu fights the way it does. That’s why Ono-ha Itto Ryu fights the way it does. That’s why Katori Shinto Ryu fights the way it does. It’s all about belief systems, viewpoints, philosophies, values. And you can see them in the story of their kata, if you are paying attention. * Drake, Susan M. (1992). Developing an Integrated Curriculum Using the Story Model. Toronto: The Ontario Institute for Studies in Education. ISBN: 0-7744-0394-2. 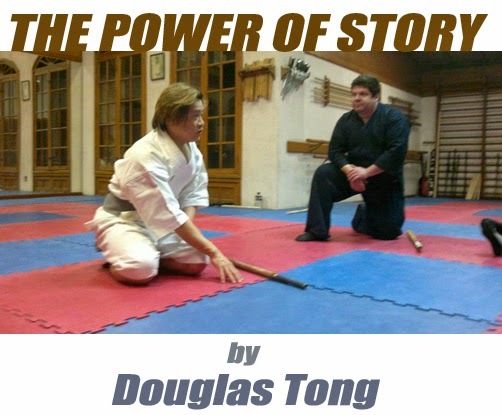 Many thanks to Tong sensei for sharing this these insights on Kata with us. I look forward to his second article on the same topic – Form Versus Function – which will be posted in the next few days. I strongly encourage martial artists in this country, or internationally, to contact Tong sensei if you would like to experience one of his seminars. His contact information is posted below.